Sometimes we get the requirement to change the key-pair for some security reasons. In this article, we will be changing the key pair of running EC2 instances. 1. Create a new key pair from AWS Console. 2. Generate Public key from newly created key pair ( Private Key ). 3. Paste the generated public key ( from Step 2 ) in ~/.ssh/authorized_keys of Server. 5. Perform ssh using new key. 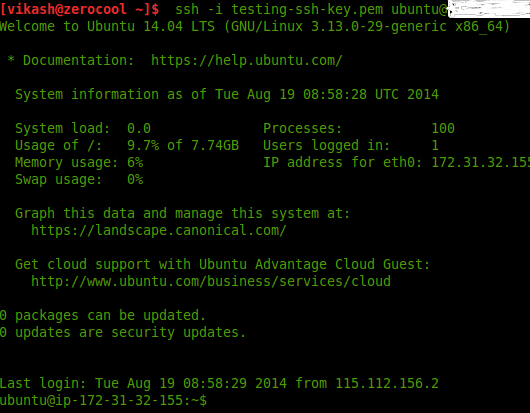 I have a running EC2 Instance ( Ubuntu 14.04 ) having key-pair “testing-key”. This is a private key that you have to download on your local machine. and provide the path for private key. You can now log in using new key. Read more about our DevOps AWS capabilities. Note: This article is not for changing key-pair if it is lost or deleted. Before performing below actions, it is advisable to take the backup of existing EC2 Instance. Thanks. This worked perfectly. Only issue is the EC2 instance is still showing the old key name in dashboard. Any suggestions to change it to new name? Yes i too tried this, but it doesn’t updates the key name in the dashboard, which might create a problem for a new person, if he doesn’t knows about the change of the perm file. Tks! Gread step by step. Solved my problem. Brilliant! It was the best article I’ve found about changing the key pairs. Tks heaps!